Economists never tire of telling us that improved living standards necessarily depend on productivity growth. This sounds eminently logical but it turns out it’s a great deal more complex than they would have us believe. This is because productivity within capitalism is a two edged sword. Increased productivity permits more goods and services to be produced with fewer hours of work but in order for the benefits to be widely shared, the newly redundant worker must successfully find some brand new means of making a living. Logic would seem to tell us that productivity growth within capitalism would normally tend to reduce the average person’s share of what’s produced and therefore result in an ever expanding gap between what the system is capable of producing and the living standards actually experienced by the average person. This is because all known material wants are already being produced by existing suppliers prior to the advance in productivity. The newly redundant workers are therefore required to struggle in a desperate contest to find some completely new activity that can earn something approaching the median income. This is clearly an extremely difficult task and the normally expected result therefore would be a decline in median income relative to the potential of the economy. Each era is different of course and events and power distributions at a particular time could temporarily offset the underlying pressure. But the basic “law of unshared productivity growth” should always be expected to reassert itself. Can we measure it historically? Statistics are always suspect but perhaps a reasonable measurement would be a comparison between median income and per capita GDP. 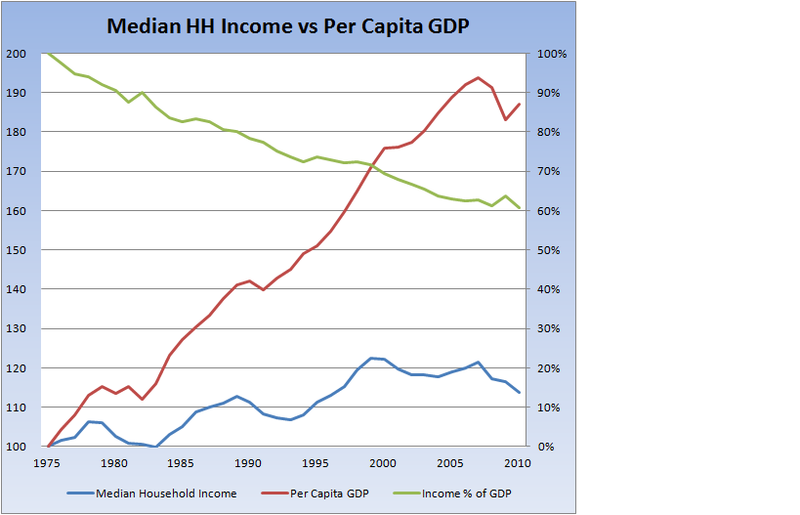 The period shown is between 1975 and 2010 and both median income and per capita GDP are initially based at 100. It certainly supports the theory that productivity growth won’t be shared in capitalism. Data before this time is harder to get, but this chart alone, encompassing 35 years is pretty damning. We see a continuous decline in the ratio of median income to per capita GDP, measured on the right axis, which in 2010 is about 60% of its level in 1975. Productivity growth isn’t being shared and the average person is living at 60% of potential if we use GDP as an indicator. It would be interesting to see this analysis carried back as far as possible but I think we need to keep some things in mind when we go further back in time. The immediate postwar decades in the US saw a massive expansion in suburbanization, highways, and military spending which seems pretty unique while the first half of the 20th century was so marred with wars and depressions that it’s difficult to make reasonable conclusions. Also, productivity advances have increased at an ever faster pace in more recent times and so its negative effects should be more evident now than in the past. Capitalism by its nature can’t provide widely shared growth commensurate with the productivity potential of human civilization and it’s way past time we demand something better. Update: There are of course other factors hurting the US worker, things like the global power of corporations, overseas competition, and the abysmal failure of trade unions to represent their members. The US worker is a beaten “commodity” as can be seen by this appalling report from today’s (12/30) New York Times. Anyone who has been an employee understands this well. Your analysis begins to make it quantifiable. Imagine if productivty growth were better shared with all stakeholders? Employee stock programs which vest over time are is a method which is underutilized. Hello Paul and great to hear from you! I totally agree that employee stock programs, if very widely shared and in meaningful amounts, would be a positive step forward. But as productivity marches ever on, some of the employees will become redundant. What then?